Good nutrition that provides enough calories and nutrients is essential after surgery because the body has increased needs to support recovery. Mammoth Hospital in California says most people do not need supplements after surgery if they can tolerate normal foods and eat a well-balanced diet. The best foods to eat are packed with vitamins and minerals that will decrease the risk of infection, accelerate healing, increase strength and energy and help maintain weight and nutrient stores. The Hospital for Special Surgery advises following a healthy diet based on MyPyramid guidelines to meet daily nutrient needs. Amino acids from protein are directly involved with wound healing and tissue regeneration. The best proteins are from lean sources like poultry, fish, seafood, eggs, low fat-dairy products, lean meats, soy products, beans, lentils and nuts. Carbohydrates are the brain’s main source of energy and prevent muscle from being broken down. Carbohydrates that are high in fiber like whole grains, fruits, vegetables, beans and legumes are beneficial because according to The Diet Channel they can help to prevent constipation, a common side effect associated with pain medications. Dietary fat provides energy and is involved in immune response and absorption of fat-soluble vitamins. MyPyramid recommends heart healthy fats from olive oil, vegetable oils, avocado, nuts and seeds. According to Mammoth Hospital vitamin A and vitamin C are particularly important after surgery because of their wound-healing properties. Vitamin A comes from orange and dark green vegetables like carrots, sweet potatoes, kale, spinach and broccoli as well as milk, cheese, liver, eggs, grapefruit, cantaloupe, mango and papaya. Foods rich in vitamin C include citrus fruits, sweet bell peppers, berries, potatoes, tomatoes and melons. The Hospital for Special Surgery also recognizes the importance of vitamins D, E and K. Vitamin D promotes bone healing and is in milk, fortified cereals, fish and eggs. Vitamin E protects the body from free radicals and comes from vegetable oils, nuts, beef liver, milk and eggs. Vitamin K is essential for blood clotting and is present in green leafy vegetables, fish, liver and vegetable oils. Mammoth Hospital highlights zinc and iron for wound healing and energy after surgery. Iron-rich foods include all types of meat and poultry, beans, apricots, eggs, whole grain breads, and iron-fortified cereals. 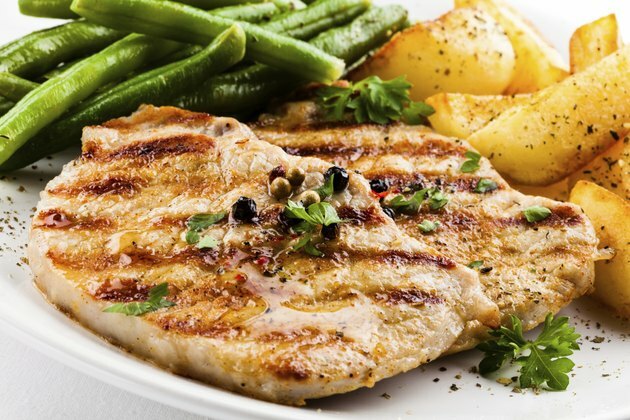 Zinc comes from meat, seafood, dark-meat poultry, dairy and beans. The American Cancer Society recommends eight glasses of water every day after surgery in addition to regular meals and snacks. According to the Hospital for Special surgery proper hydration is essential for healing and even more fluid may be necessary depending on the type of medication an individual is prescribed and the extent of the illness or injury.